Blue skies. Blue vistas. Blue waters all around. That is the arresting beauty and charm of The Hibiscus Beach Hotel situated just a short drive from the capital Colombo, in the coastal town of Wadduwa. The tranquility and charm of the Hibiscus Beach Hotel gives the visitor peace of mind and allows them to enjoy the serene ocean view as if on their own deserted beach.ay. Endless golden beaches for you to explore in solitude. Azure skies leading up from the infinite horizon of a mysterious Indian Ocean. 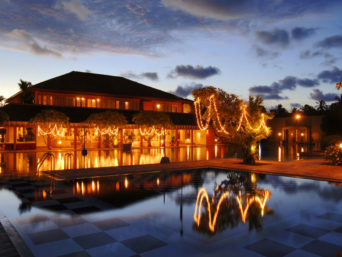 Warm and friendly hospitality that Sri Lanka – the Pearl of the East – is famous for. Hibiscus Beach Hotel, nestled in the Kalutara coast of Southern Sri Lanka, welcomes you to come and stay, for an idyllic holiday of leisure and tranquillity. Hibiscus Beach Hotel a high quality beach resort located in the Kalutara coast of Southern Sri Lanka provides you with the best facilities you will ever come across. USD.456 (USD) From 2014-11-01 to 2014-12-24 per person. USD.646 (USD) From 2014-12-25 to 2015-01-10 per person. USD.577 (USD) From 2015-01-11 to 2015-03-31 per person. USD.326 (USD) From 2015-05-01 to 2015-07-31 per person. USD.364 (USD) From 2015-08-01 to 2015-10-31 per person. Rates are per person on double (DBL) sharing standard(STD) on half board (HB) basis including taxes.